This is not politics or anything close to that. I am just going to say something that I have experienced for over four years while at this special home, Goshen College. I know many people ask the question of how much experience someone has over an issue, hence I am just warning you in advance that in this project of mine, there is no O(baMa)cain politics here. For the time that I have been in Goshen, I have had both my very worst times in my life and at the same time, the very best of all. Because of the limited space, I will focus on one and follow it with the other next time, God-willing. I don’t want to focus on anything but Mennonite “culture,” as some will call it, a “culture of service.” It is so fascinating to be around Mennonites whether a non-Mennonite agrees with me or not. Over time, I have observed the “experienced” Mennonites and admired how welcoming they are. As the saying goes, “old is gold” and “experience is the best teacher.” These individuals possibly have “seen” the eyes of God or “touched” God’s feet. It is my joy to say that I have experienced love, care and hospitality whenever I needed it in this Mennonite community. I can recall when I had no food to eat my freshman year, and an elderly Mennonite was able to provide me with food every evening. She would come and drop pumpkins, tomatoes and other vegetables by my door. Also, I had no money to pay for rent during my sophomore year. One of the Mennonites offered to pay for my rent that month. This is after she learned that I was going through some difficulties and that none of my relatives were close enough to rescue me from being kicked out in the snow by my landlord. Where can anyone get such special treats other than in a Mennonite community? Moreover, when I was about to drop out of school in my senior year because of lack of finances, another prominent Mennonite and highly-ranked retired Goshen College faculty came to my rescue. The question is this: why am I just talking of “experienced,” or as you may call them, the elderly Mennonites, and not the young, “energized” ones? I don’t need such direct help from young Mennonites. What I need is something different. Something exciting. 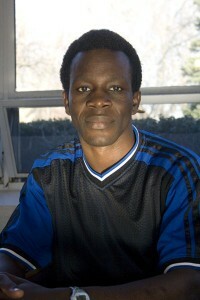 Ramadhan Onyango is a senior biology and biochemistry double major from Nairobi, Kenya.